I typed up a fabulous cookie recipe on Sunday evening to be published Monday morning, and I forgot about Mammal Mondays. Crud. 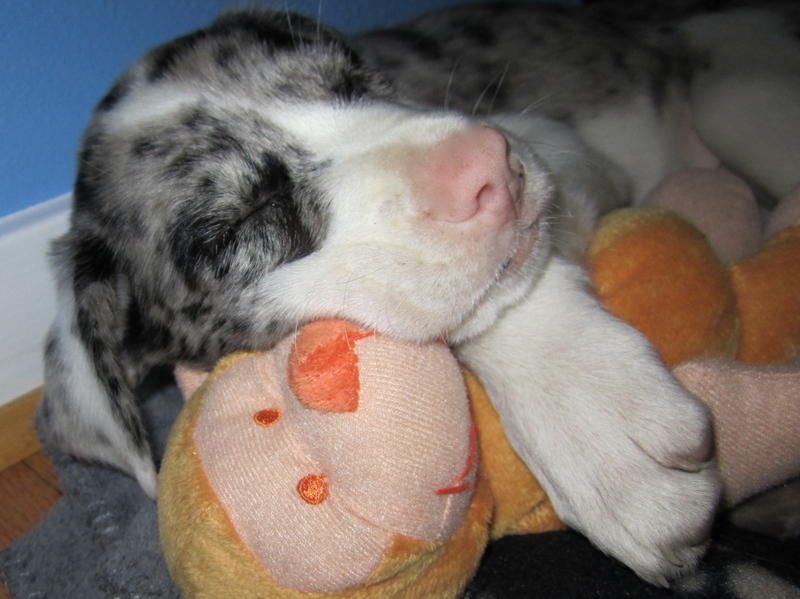 Today, I’m sharing one of the first photos I have on record of my sweet Sherman at eight weeks old. He’s hiding under the coffee table that used to hold up my tv, snuggling and snoring with his stuffed monkey. Oh, my goodness. Puppy love. Every time I look at this photo, I think about how tiny and sweet he was here, less than ten pounds and eager to snuggle at all times. I remember holding him on my lap and him making those little snuffly puppy sounds and grunting while he sniffed everything. I go back to all those first time puppy moments, the first bath, the first walk on a leash, the first time he learned to sit on command. Luckily for me, soon after all the wistful recollections, I remember him peeing on the hardwood, chewing the handle off a drawer, and needing to go out several times each night so his kennel didn’t become a swimming pool. I think back to the days when he screamed on car rides like someone was pulling his wee toenails out with a pair of hot barbeque tongs. I love my mostly grown puppy. He rocks.